Honda ranks of motor sport are increasingly in demand in line with the market share sports segment PT Astra Honda Motor (AHM) in September 2016, which reached 60% with sales of 31 483 units. Market share in the sports segment is once again the highest in the last seven months since the AHM master the sport bike market country. The data obtained from the Indonesian Motorcycle Industry Association (AISI) national motorcycle sales in September 2016 began to writhe with record sales increase of 5.4% from 527 536 units in August 2016 be 555 820 units last month. Honda's motorcycle sales rise higher than the increase in the national motorcycle market that grew 8.8% from 388 847 units in August 2016 be 423 256 units in September 2016. It is delivering AHM lead the national motorcycle market share of 76.1%. Positive growth was also attended national sport motorcycle market by 18% from 44 429 units in August 2016 became 52 435 units in September 2016. Following the increase, the sport model Honda also surged 60.2% from only 19 648 units in August 2016 became 31 483 units last month. This achievement delivers Honda recorded the highest monthly sales market share in this year ie by 60%. In this segment, the All New Honda CB150R StreetFire give the largest contribution of as much as 18 626 units, followed by Honda CBR series as many as 8063 units, Honda Verza 4,647 units, and Honda megapro 105 units. Meanwhile, Honda Big Bike sport contributed sales of 42 units. 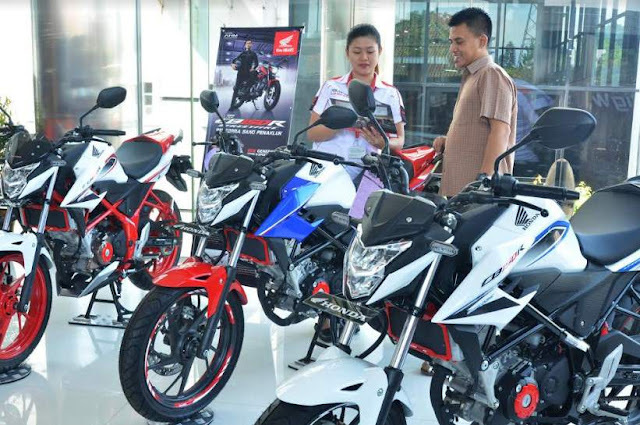 General Manager Sales Division PT AHM Thomas Wijaya said the high spike in demand for Honda sports bikes reflect the higher confidence lovers of motor sport in the country. Honda ranks of motor sport is expected to continue to accompany the lifestyle and everyday consumers Honda in achieving his dreams. "The condition of the motorcycle market this year is still weaker than the previous year, but we see the public interest against the greater sport motorcycles. This gives us the motivation to always deliver a product that is able to meet the needs of lovers of the sports segment in the country through a variety of embedding the latest technology and a variety of product enhancements Honda motorcycles. " In another segment, scooter Honda sold 355 693 units with 79% market share of the scooter segment as many as 450 363 units nationwide. Honda Beat series provides the largest contribution of 187 346 units, followed by Honda Vario series 121 603 units, the All New Honda Scoopy ESP 46 069 units, the All New Honda PCX 571 units, and Honda Spacy 104 units. 0 Response to "Honda Motor Sport More Attractive, Leading 60% Market Share Indonesia"